Pregnancy, Church & the Holiness Police. I have observed that when Christians get pregnant out of wedlock in the church in many cases they would have received more mercy if they had committed murder. With murder the ‘holiness police’ may even jump to their defence saying it was totally out of character, definitely self defence, it’s that boy friend she got with-he was always going to cause trouble or even say that they’ve got the wrong person! That one my ‘spirit’ always picked up something about her…double life. Well what do you expect? They’ll say, The girls these days they haven’t been raised right. From the time she started wearing makeup in the choir, I knew she was a fast one! The bible says God is no respecter of person and that all sin is equal so why do we in the church put so much weight on one transgression over the other? Seriously, I KNOW from that experience alone that I am a strong woman because how ‘the church’ turned on me was real and without mercy but I would still show up every week. I point blank refused to sit at the back just because my short coming was on public display and theirs were hidden…who were THEY to dictate my process of repentance and restoration? Women whether teenagers or adults need support and love shown to them during this time. Don’t you think they feel bad enough? You haven’t seen the tears they cried before God, or their prayers of repentance. Their longing to feel forgiven enough to be used by God again and their feeling of shame and loneliness ever compounded by the church’s ‘holiness police’, It’s as if as long as the bump is visible the sentence must stand. Only fading slightly as you attend with your baby maybe out of pity or because who doesn’t love a baby after all. Unfortunately your history is forever stained and your anointing questioned, like a Scarlett letter worn by women of old caught in the act of adultery. Anyway back to women needing support and love. The church is great at telling you what time it is AFTER the pregnancy has occurred but what about BEFORE? I know many churches today with great leaders, youth ministries and women’s ministries where there are mentors and accountability partners ready and waiting to stand with you but unfortunately especially in the predominantly West Indian old school church system where I was raised they are grossly falling short in this area. So many gifted women and girls simply disappear from church and even give up on God after a pregnancy. This BREAKS MY HEART. God never said he was finished with them yet. Man did. I remember the ABSOLUTE SHOCK I had when I found out that a respected elder in the church had all of her children OUT OF WEDLOCK. She and her husband were not running to share their story with me or other young men and women. Instead they were part of the of the lynch mob. What an amazing opportunity for them to demonstrate Gods grace and love. To actually minister accurately and precisely in this very area they once struggled in. It was a totally missed opportunity. So I write and share my stories because God told me to, many years ago. I didn’t know where to start but I knew that I had to obey because if one person could feel like they were not alone I would feel my pain had not been in vain. I’m grateful for what I’ve experienced because my pain became my story and my story has proven over and over again God is real and that His love never runsout. Thank you God for my big mouth that whether I’m talking, typing or singing what’s in my heart, I know your leading me. Next You’re healed! Didn’t you realise?! As Christians, we are called to walk like Christ. He never condemned or judged. In fact, in the Word He hung out with so called “outcasts” rather than people who thought they were high and mighty. Jesus’s showed they love, care and understanding. So, when Christians act up like this, I wonder..do they ever take the time to actually go into the Word and KNOW Jesus’s, rather than just playing church?? I believe God allows us to go through certain experiences so that once we go through and learn the lesson, we pay it forward by helping someone else who may need to hear how WE made it through. It gives others hope. That’s what the church need to understand. It ain’t about being holy, it’s about being like Christ and showing kindness, love and mercy. Thank you so much Anne! Once you’ve gone through these things it really messes with your heart. You know you have a God who loves you and has forgiven you yet you are surrounded by people who claim to serve the same God treating you as an outcast. Really appreciate you taking the time out to comment with your wise words. Oh this is so familiar!! 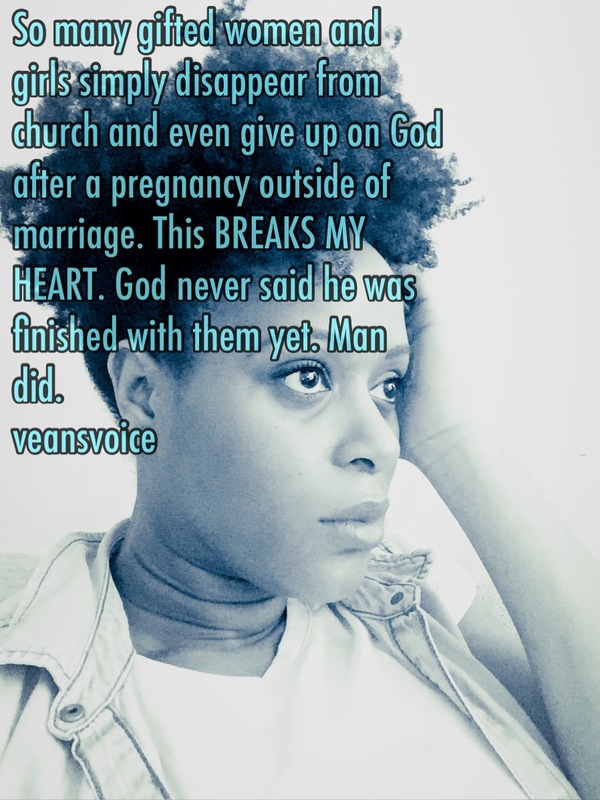 Once a friend fell pregnant outside of wedlock and the church literally went into a frenzy! She was the general topic of all gossip, which extended to her mother’s bad parenting and an array of lies! Funny how the people who are meant to rescue and counsel you are always on the judgement forefront! I know for sure that my parents had all 4 of us without being married – seeing as we were all present at their wedding lol. I honestly don’t think that it is a big deal, mistakes happen. Remember for all have sinned and have fallen short of God’s glory? Folk tend to forget! The church is meant to be a second family but nowadays is a haven for showing off new outfits and talking about the next vacation in the Caribbean! So sad!